Comprehensive terms and conditions template for a travel company or tour operator where clients organise their own flights and travel to the meeting point. It can be easily customised to your precise requirements, whether you offer walking tours around South Africa, weekend ski breaks in Europe or much longer holidays further afield. 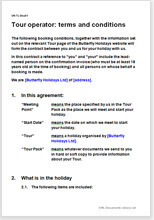 This is a model terms and conditions template for a tour operator or travel company where clients organise their own flights and travel to the meeting point. The terms are written to protect you but are fair to your clients as well. This document is suitable for companies that offer all sorts of holidays, from day trips locally with few additional services provided, to all inclusive holidays around the world lasting weeks. Your business might specialise in a particular type of holiday such as archaeological tours, or it might be a generalist offering package tours to popular beach locations. Your terms and conditions reflect how your business works and therefore are unique to your company. The way that most holiday and tour companies work is similar (for example, in having a cancellation policy), but the detail will vary between companies (such as how many days notice is required before a deposit is lost). This template reflects standard practices within the travel industry and it should give you a very good basis for your own terms. However, you will need to spend a little time customising it to reflect how your business works. In the travel industry many contractual terms are also part of the explanation of what is provided and how and where and when. For this reason, we have followed the industry practice of presenting the terms in a layout that does to look like a legal document. For example, paragraphs are not numbered, there are no lists and we have not used legal jargon. That does not mean that the legal effect is in any way diminished. We prefer this less formal format because your customers are more likely to feel happy buying from you if they understand your terms and don't feel overwhelmed by legal jargon. We also feel that the format is more suitable for brochures and web sites, where you are likely to display them. Of course, if you want to add back paragraph numbering or change words, you are free to do so.